Represented by LUDO GAllery at Affordable Art Fair in April 2015. 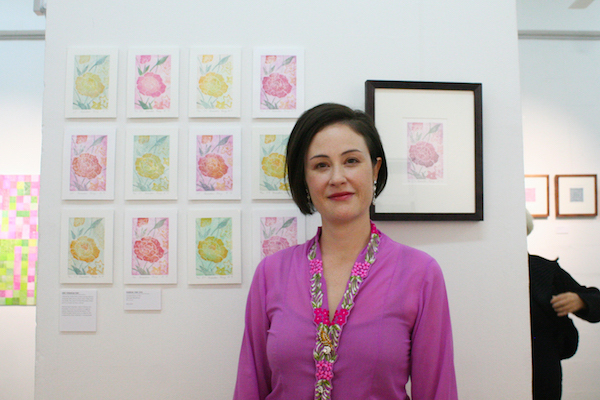 In 2015, I was invited by LUDO Gallery to participate in the Affordable Art Fair Singapore. I was just starting to get back into my art career after a decade-long diversion as a Japanese translator. I was happy that several works were sold and some of my clients even included a gallery owner based in Japan, who purchased my mixed media piece Temasek Travel - Archipelago. Thanks to the great response from the Fair, I gained the confidence to work towards a show with LUDO - my first ever solo exhibition since graduating from the Australian National University in Printmaking fifteen years ago. Creating work on a full-time basis often felt like getting 'back on the bike' - perhaps with slightly squeaky wheels! I owe a lot to the patience of my family, friends and especially my Indonesian helper, Dini. As an art instructor, I also love to share my experience in printmaking and show the beauty behind the multiple techniques that it offers. Japanese woodblock in particular is a favourite medium of mine and I enjoy revealing the ins and outs of this often-mysterious tradition. I offer workshops on a regular basis and you can learn more here. I learnt an amazing amount through these valuable experiences and am grateful to all my supporters. My journey into history and culture in Singapore is filled with surprises and touching moments as I uncover my father's place of birth. First photoshoot - looking a tad nervous, my dear! Learn more about my discoveries in my monthly newsletter.